An appalling masterpiece. Resist the temptation to laugh at the film's violent anticommunism and try to see it as the audiences of 1952 did, and you'll experience the most wrenching right-wing film ever made. 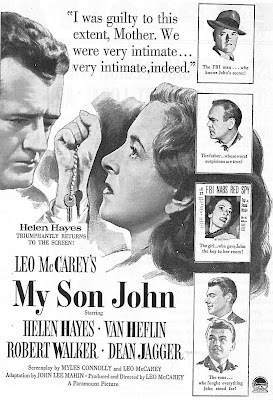 The film's propaganda is all the more powerful because director Leo McCarey refuses to acknowledge any intellectual, ideological intent: his argument is wholly emotional, and it is a powerful one. Robert Walker, fresh from Strangers on a Train, is a government worker who signs with the reds in oedipal revolt against his domineering, patriotic father (Dean Jagger); Helen Hayes is the mother who must choose between son and country. Oh boy. After I see this thing I'll have some comments.